Cities can make middle-scaled buildings the most economical development program. The last decade has been punctuated with celebratory stories of once-again active downtowns and town centers. Many places seem to have cracked a once-secret code for commercial redevelopment and new mid-rise housing. Yet for every revitalized town center, there are miles and miles of auto-dominated streetscapes and low-density housing overshadowing progress on Main Street. 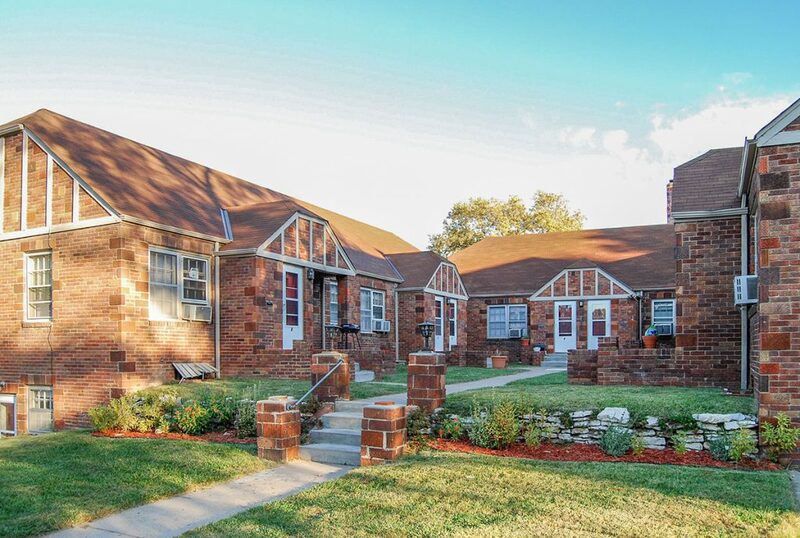 Retrofitting suburbs nationwide is critical to address the extraordinary challenges of our time, like climate change and social isolation, to say nothing of the growing market demand for more walkable places with diverse things to do. To address the redevelopment challenges of the suburbs, new tools must be designed in accordance with a fundamental principle in American real estate: the most convenient and profitable buildings are what gets built. A new technique called a pattern zone can be used by cities and towns to make good urbanism a natural outcome of their local real estate market. Before zoning codes and land use lawyers, cities were built from pattern books containing construction plans for the building types in common use, from mercantile shophouses to single-family and apartment homes in the fashion of the day. Cities and their suburbs can restore a level playing field for middle-scaled building types by employing this approach again. 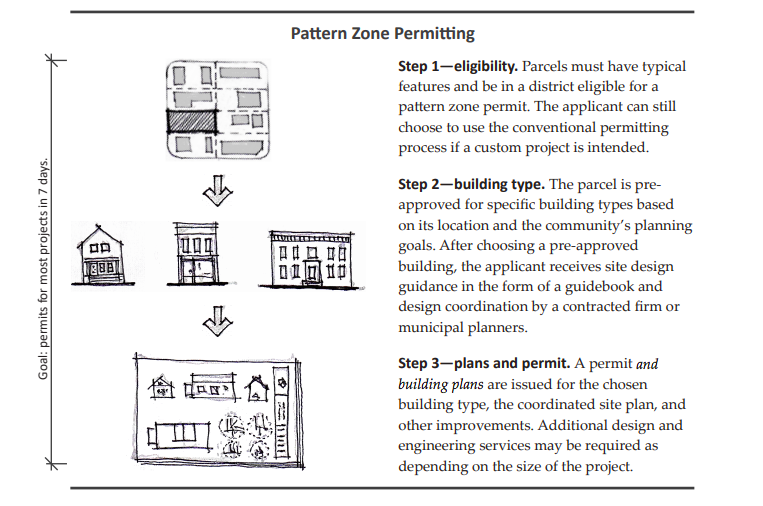 A municipal pattern book with pre-approved plans is at the center of the pattern zone concept. When our cities were just starting, building regulations were simple or nonexistent. Development decisions were driven almost entirely by material and labor costs. Markets weren’t distorted by home ownership programs or zoning prohibitions. Small- and middle-scaled buildings are so prevalent in the oldest parts of American cities because they are the most economical to build when all else is equal. A pattern zone resets the market response by radically lowering barriers to light multi-family projects, neighborhood commercial storefronts, and large lot retrofits. It changes the market activity because it lowers those barriers in ways that are valuable to developers: time and money. Cities pass the value of the architectural and engineering drawings on to their applicants, saving on the predevelopment costs of designing a completely original project. Permits for pre-approved buildings are fast—the technical review is already complete! For a missing-middle project, the savings can equal thousands of dollars per unit, once again making middle-scaled buildings as economical as single-family subdivisions and large-scale developments. When it comes to suburban retrofits, a new approach is necessary because most other approaches don’t work—at least not in isolation. So many planning documents present an incredible vision but then rely on “recruiting developers” as a catch-all implementation strategy for private-sector engagement. It doesn’t work. Look around your community today: the new development you observe reflects the most convenient and profitable path available. It’s probably more single-family subdivisions and mid-rise or garden apartment campuses, even if you already have a plan that makes your city proud. Too many cities fall into the trap of thinking mere permission to build better will result in better building. Unfortunately, better buildings are only produced when building better is the easiest path. Not even form-based codes—which emphasize the design of streets and buildings, instead of segregating them by use–are enough to assure viable redevelopment for the suburbs. Advancing a neighborhood or a corridor towards a “watercolor vision” of its future requires many small steps, with ongoing governance requirements and many actors coordinating their work. While the good planners already know this, too many cities fall into the trap of thinking mere permission to build better will result in better building. Unfortunately, better buildings are only produced when building better is the easiest path. This is a cold fact of the real estate market, but cities can turn it to their advantage, using a pattern zone. When implemented, a pattern zone combines code revisions, a granular regulating plan, and a pattern book of construction drawings to create an expedited, low-barrier path for small- and middle-scaled real estate projects. A municipal pattern book would contain six to ten buildings with associated design drawings, each designed for appropriate architecture and competent urban design and analyzed and reviewed for code compliance by a municipality’s building safety division. They come with a preliminary permit and are ready to bid and to build. The pre-approved nature of the pattern buildings is the pattern zone’s most important component. 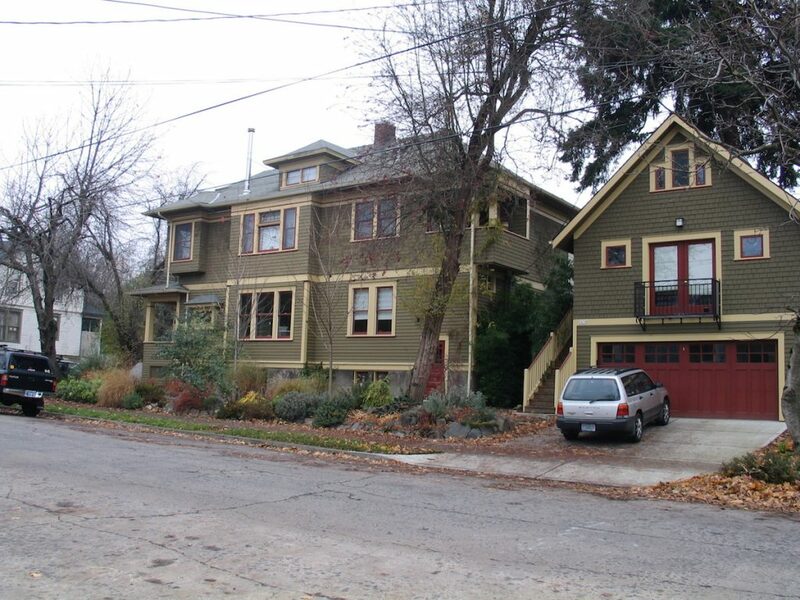 To implement this technique, a city or county government identifies a specific geographic area for infill development such as a corridor, neighborhood, or a master-planned district, and pre-approves a set of buildings to be built on each lot, or at least the very important ones. The pattern book also comes with generalized site development plans that work on typical parcels contained in the pattern zone area. The combination of pre-approved construction drawings and generalized site plans triangulates the local government’s long-term goals with developers’ project-level decisions and the community’s values. It’s the pre-approvals that make it simple to develop quality projects. Even the permit reviews themselves are more straightforward for both applicants and the administering jurisdiction. Whether a city or county uses form-based codes or conventional zoning (with critical amendments), the convenience increases certainty that developers will build projects that lead to healthier, more resilient, and more sociable neighborhoods. Developers always have the option of applying to construct a custom project using the conventional entitlement pathways already available to them, because a pattern zone exists alongside current procedures as a parallel track available to applicants at their discretion. It’s just that doing a quality building that’s been pre-approved is so much easier and faster. It’s competent architecture and urbanism that is also conveniently off-the-shelf. That doesn’t mean pattern buildings would look the same every time they are constructed. A pattern zone would allow and even encourage small variations like changes to materiality and ornamentation. In this way, pattern zones are reference standards. Whereas zoning and development codes are written as minimum standards intended to prevent the most egregious design and construction practices, a pattern zone is a reference standard that makes developing neighborhood-oriented residential and commercial projects the most convenient entitlement pathway. For cities that are considering regulatory revisions to get better urbanism but still aren’t certain how much scrutiny they should give to middle-scaled projects, pattern zones are an answer. Large projects can’t be pre-approved because they justify extensive review, but small- and middle-scaled projects approved in a pattern zone reduce review burden while ensuring that the health, safety, and welfare of the community is enhanced. Communities that fail to address the suburbs with a solution that can scale citywide and regionally will be at distinct disadvantage in the near future. The suburban experiment is conclusive: suburbs aren’t resilient. What’s more, they are overbuilt. There are more suburban homes than people want, and we have more suburban retail than can be rented. They cost more to maintain than the revenue they generate, and so old subdivisions nationwide are falling into decline. Those which do not voluntarily invest in their own maintenance will continue that trend. There are other suburbs that will remain stable. If they are in a popular region, they will become ever more exclusive and expensive. The decline of other suburbs combined with regional housing scarcity already makes stable suburbs into a luxury product few can afford. The suburbs will have to be remade to address the twin challenges of decline and exclusivity. Urbanizing the suburbs will not look or feel like urbanism in cities. It will be smaller and more incremental. When done right, it will be inviting and comfortable. Making suburbs into what are functionally small towns means making them less vulnerable to economic shock. It means reducing their outsized contributions to climate change. It means reducing the social isolation and the unhealthy outcomes attendant to the current suburban pattern. A pattern zone is a way cities and towns can change that pattern, and they should. Download an information sheet on pattern zones here. Matthew Petty is a planner and developer in Fayetteville, Arkansas. He has been elected three times to the Fayetteville City Council and teaches small parcel development workshops for the Incremental Development Alliance. He develops missing middle and mixed-use projects in Northwest Arkansas as the founding principal of Infill Group.